plus many smaller companies with big ideas. Unlike most copywriters, I know first-hand about being a busy marketing manager. I served as VP Marketing for a successful software startup; in three years, I helped grow revenues from $250,000 to $14 million. And using white papers helped us “eat the lunch” of much larger competitors. Then I helped write the business plan used to sell the company at a good valuation. From startup to acquisition: Not many copywriters have been there, done that. 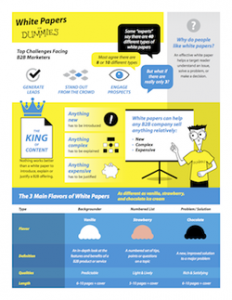 To get noticed, your white paper has to be great. But most white papers are not nearly as engaging or persuasive as they could be. I think that’s a shame. And since 2001, I’ve tried to help B2B companies turn that around. I’ve done research, written a stream of articles, published the leading book on the subject, and made dozens of presentations to creative professionals on how to make white papers better. Whether you need a white paper planned, written or revised, I am “that white paper guy” for you.